Make sure that you have batteries in your flash lights just incase the electricity goes out and have the adults in the house charge there cell phones incase there is an emergency. I’m gonna watch some tv and then go to bed. I wanna hear the rain on my bedroom window. This entry was tagged blog, kid friendly, laugh, Mr. 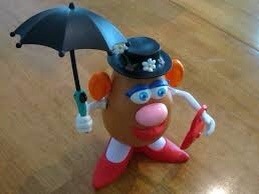 Potato Head, rain, stay inside, umbrella. Bookmark the permalink.